Things Hidden Since the Foundation of the World presents a highly original global theory of culture. Here, in his greatest work, Rene Girard explores the function of violence, mimetic desire and the mechanism of the scapegoat, in the history of society and religion. 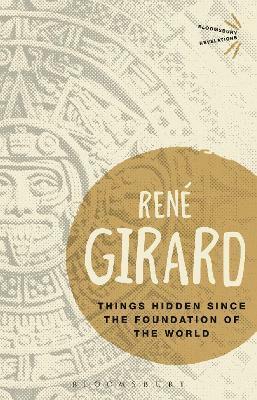 Girard's vision is a brilliant and devastating challenge to conventional views of literature, anthropology, philosophy and psychoanalysis. Rene Girard (1923-) was Andrew B. Hammond Professor Emeritus of French Language, Literature, and Civilization at Stanford University, USA, from 1981 to his retirement in 1995. A historian, literary critic and philosopher, he is the author of over 30 books including Violence and the Sacred.